Elena, originally from Kosovo, freshly aged 25, being younger she was predestined for a scientific career, especially after 5 years in biology in the Jura. Arrived in Strasbourg, BAFA in her pocket, she will first practice a few months in Germany, back in France she will work 3 years as a facilitator in elementary school before meeting the Amsed. Committing to others is her pleasure ! After having made beautiful meetings at AMSED and wanting to commit to others, it is in August 2017 that she decides to go to Ivory Coast. The young woman recounts her stay with eyes full of nostalgia, she had among others the mission to give the taste of learning to children and women illiterate people in this country. 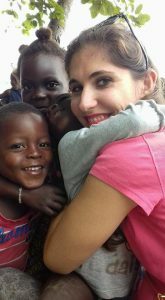 It is with great humility that the young French girl gives herself up “I do not pretend to believe that I was going to teach them to read, but the little time I spent with them allowed me to give them want to go back to school to learn to read ” ! She likes to be useful and wants to do her job ! Moreover, today she would like to become a specialized educator because according to her, her commitment has allowed her to have a click. For her to be an educator it is aided people, to allow them so much of a moment to enjoy the taste of life, it is the work for others with others. It is with this state of mind that she is leaving for Fez in Morocco, to commit once again. Lucid, she hoped to be able to bring a little joy through animations and her investment, because what she think time is a precious good. The time she spends in Fez is the time that she chooses not to spend with others, but that is a part of pleasure.